Pledge for each SUNNY day between May 23rd and the solstice on June 21st! Your donations allow Ecolibrium3 to help families struggling to pay their energy bills, support the development of the Lincoln Park Solar Garden, and revitalize the Lincoln Park neighborhood! The 40 kilowatt array will be located along I-35 and W Michigan St, at the gateway to Lincoln Park and Duluth’s downtown. Ecolibrium3 plans to make the Lincoln Park Solar Garden a hub for community education and engagement on energy generation and Duluth’s sustainable future! Your donation will help us make this project a beautiful and productive amenity for the next 25+ years! OUTSHINE the competition by correctly guessing 30-days of Duluth’s weather! 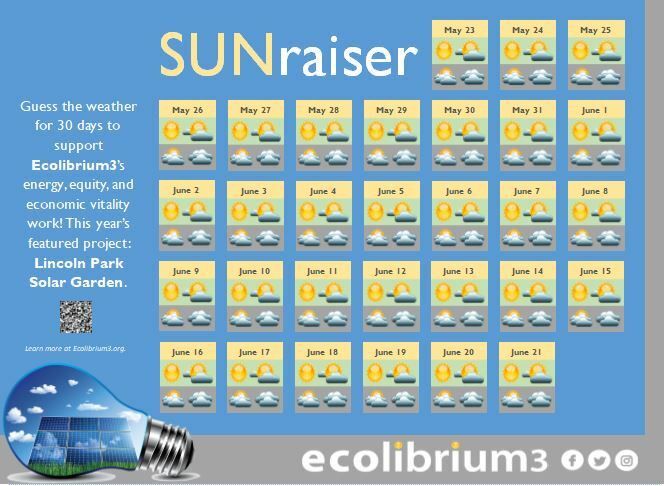 Local sponsors have pledged a donation to Ecolibrium3’s work and the Lincoln Park Solar Garden for correct guesses. We will let you know how successful your guesses are and keep you updated on the community impact of our work. To learn more about business sponsorship opportunities including day sponsorships, corporate donations, and/or providing prizes use the link above or contact Lucas@ecolibrium3.org. Let us highlight your guesses and spread the word about the SUNraiser! A little friendly competition and perhaps some bragging rights? Each day during the SUNraiser we will be featuring different community leader, business, and resident guesses. We ask that each Featured Forecaster sign up and we’ll choose 1-day and place them in a challenge against other forecasters. We’ll post guesses and declare a Champion based upon the actual weather. All predictions and the Featured Forecaster forms should be submitted to Ecolibrium3 by MAY 15th. Participants will need to provide a photo and give permission to use the photo and quotes. We also ask all Featured Forecasters to help spread the word to friends, family, and co-workers.